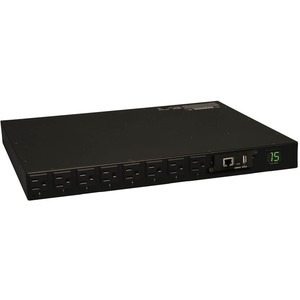 PDUMH15NET Switched, Metered, 1U horizontal rack PDU supports 15A maximum capacity at 120V (agency de-rated to 12 amps). Includes attached 5-15P input cordset and 16 5-15R switched outlets (8 front / 8 rear). Visual and remote current monitoring tracks the output current. Supports 1U horizontal rackmount installation in 2 or 4 post racks, plus 0U vertical, wallmount and under-counter installation in many applications.